The Pullman train car, which has remained parked beside a warehouse in an industrial area of Lubbock, hasn’t moved since 1958. 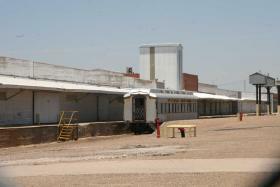 A Pullman passenger car, parked on an abandoned section of railroad beside a quiet warehouse in an industrial section of Lubbock, represents a time when cotton was the center of Lubbock’s universe. In cotton’s heyday of the 1950s, the car was variously filled with businessmen, political contenders and the family of Archie Underwood, who was a businessman and the cotton-compress dynamo of the South Plains. The car, like Tara before the Civil War, was a hub of activity. It housed business meetings in Lubbock, carried politicians to their next campaign stop in Dallas and instilled memories for a lifetime in Underwood’s grandchildren who watched from a glassed-in compartment while portions of the nation sped by. In his cotton compress business, Underwood had built an empire of 28 warehouses, and he had major influence with Santa Fe Railway as a prime customer. Whenever he wanted to travel, he called a contact in the railway company and asked for his car to be hooked to a passing passenger train or even to a freight train headed in the direction he wanted to go, and it was done. Now, because the rail car is considered a crucial part of Lubbock’s history, the family has committed $50,000 toward moving it to the Bayer Museum of Agriculture on a hill in southeast Mackenzie Park. The car weighs 282,000 pounds, and it’s expected to cost $275,000 for the relocation and refurbishing. Since the railroad track it’s on no longer connects to the main line, two cranes will be needed to hoist it onto trailers for a careful trek to Mackenzie Park, and then two cranes will have to set it on a rail track that will be built beside a concrete pad for an envisioned standalone exhibit for the museum that’s dedicated to this region’s agricultural history. Laurin Prather, one of the grandsons of Archie Underwood, thinks it would become a magnet for the children of this region. Lacee Hoelting, executive director of the museum, said there is a plan for restoring the car and placing it on the north side of the parking lot. There’s nostalgia to the car’s history for Louise Underwood, daughter-in-law of Archie Underwood. “That particular time when we went out to California — my little twins were just babies. They couldn’t have been over a year old, though they were walking. When the others would go in to the hotel, we stayed on the train car. Prather said that his grandfather used the car for business trips, for political purposes and to attend cotton meetings. According to Pam Brink, the Lubbock Heritage Society hopes to obtain funding for the moving and renovation of the Underwood Pullman Car for permanent display at the Bayer Museum of Agriculture. In an overview of the car project, Brink said, “Arch Underwood was a deeply committed and very effective lobbyist for the inland cotton compress industry and became the political confidant of many in the Capitol. He knew President Franklin D. Roosevelt and entertained President Harry S. Truman and President Lyndon B. Johnson in Lubbock on this Pullman. “He also hosted visits from Speakers of the House Sam Rayburn and Jim Wright. All of these national politicians were strong supporters of Texas agriculture and Underwood stayed in close contact with them to ensure that the West Texas cotton industry remained a top priority. According to Louise, family was important to Archie Underwood, and he also was a man of innovation. “Granddaddy took out the partition between the rooms in the center to make a nice meeting place for grownups, and yet only lost the sleeping space of the two lower births. The two upper ones could still be used, if necessary. The Underwoods and the Lubbock Heritage Society are hoping funds will become available to take the Pullman car on its last trip — to Bayer Museum of Agriculture. They figure that trip would be fun, also.